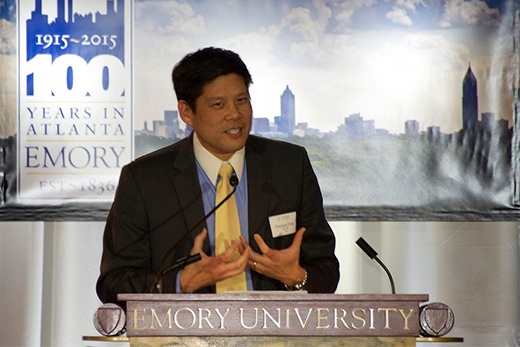 Federal civil rights attorney Stephen Ho Chen, 95C, 00L, credited Emory for helping him discover the power of "yes" — the belief that things can and will get better — during a Feb. 2 keynote address at the 2015 Founders Week Dinner, which marks the launch of Emory's "100 Years in Atlanta" centennial celebration. Founders Week commemorates the first official meeting of the founders of Emory College on Feb. 6, 1837 — two months after the State of Georgia formally granted a charter to establish the college — with an academic festival that celebrates the university's role in promoting inquiry and intellectual life. Hosted by Emory President James Wagner and the D.V.S. 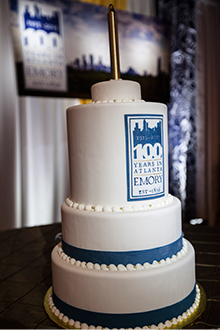 Senior Society, this year's Founders Week Dinner drew about 360 guests and marked the kick-off of "100 Years in Atlanta, " a year-long celebration that recognizes the university receiving a charter to establish an Atlanta campus in 1915. Chen, a supervisory attorney with the U.S. Department of Education's Office of Civil Rights in Denver, Colorado, opened his address by reflecting on the task of preparing remarks for the evening, which found him recalling "all the things I learned at Emory, those critical experiences that shaped me." "There were so many of them," recalled Chen. "And yet as I thought about it, I felt like I could distill it all down to a single word … and that word is 'Yes!'" "It's that concept that I really learned here at Emory, that belief that things could be better," he added. "Emory gave me that belief and gave me that sense of optimism." Born in Decatur, Chen grew up in the Atlanta area and came to Emory in the mid-1990s, back when Asian American and Pacific American students represented only a small fraction of the campus community. "I got all the questions and curious looks that you might expect growing up in the South: Where are you from? No, where are you really from? Do you know Kung Fu?" he recalled, chuckling. "I always felt badly that my parents, who were immigrants to this country, faced much more insidious discrimination," he noted. "It kind of broke my heart, because I never think they felt that sense of belief that they could do something about it." Shortly before attending Emory, Chen recalls his mother telling him, "One day, you're going to be our voice, our advocate, for me, for your dad and for our community," he said. As a freshman, Chen found few Asian American students, faculty or staff at Emory — a fact that sometimes had unexpected consequences. Chen recalled standing in the lobby of a residence hall once when another student rushed up and handed him a $20 bill. About the same time, an employee from a Chinese take-out restaurant walked through the door with a delivery. "At the time I was too shocked to say anything about it — hardly the advocate and the voice that my parents hoped I would be," he said. "But here's the thing: It was these moments that moved me further in my understanding of my racial identity and started me down the path to fight for civil rights and social justice, that made me realize the status quo is unacceptable when it is wrought with ignorance and inequity … that woke me up to that possibility of community organizing, getting the Asian American community together, founding organizations here and also reaching out to partner with other people … who had common visions, common needs, and common desires of creating a better community, a more welcoming, inclusive community, a more knowledgeable community about difference. "So that's what I did," he said. "Emory was this amazing sand box — and I believe it still is — that really encouraged innovation and experimentation." Chen would go on to found Students in Alliance for Asian American Concerns (SAAAC), a group that would eventually become today's Asian Student Organization (ASO), and dedicate his life to furthering civil rights and social justice. "It was really the environment that Emory created — one in which Campus Life professionals and faculty encouraged and supported me in trying this endeavor — that allowed me to believe that change could happen, that mentored me and trained me to become a better leader, that taught me how to organize," Chen said. "It was Emory that taught me that the status quo is not fixed, and it was Emory who gave me the tools to affect that change," he added. President Wagner thanked Chen with a playful reminder: "You needn't worry that Emory has become perfect," he said. " We are on a path, however, we try to be on a path, that leaves ignorance and inequity behind as we move towards knowledge and justice." Wagner closed the evening with reflections on the launch of "our 100th anniversary," recalling how a "falling out" between the Methodist Church and Vanderbilt University prompted the church to determine whether a new university should be built in Atlanta or Birmingham, Alabama. But it was a local Methodist Sunday school superintendent named Asa Candler who would change history, Wagner said. Candler, "whose day job was the founding CEO of Coca-Cola," wrote the Methodist Church to propose bringing the campus to Atlanta. In exchange, Candler offered to donate 75 acres of land (the first of about 650 acres, Wagner noted) and $1 million dollars. "Not only that, I'll throw in my brother — you'll like him because he's been the president of a little college called Emory College in Oxford, Georgia," he said. "This is what we are celebrating when we say 'Emory in Atlanta,'" Wagner explained. "Throughout the year, we will take time to recall the rich partnership that we've had with the city in nurturing scholars, public servants, healers and teachers, ministers, business leaders, nurses, lawyers and artists, and many others — all of whom have helped bring about that positive transformation in the world that we talk about in our vision statement," he added. "It's a legacy of work that both enables and ennobles," he said. "It's a legacy that continues to unite us in a great purpose to affect positive good in the world."